Arunachal Pradesh Governor B D Mishra on Tuesday took stock of developmental activities and the law and order situation in East Siang district, during a meeting with the Deputy Commissioner (DC), Tamiyo Tatak and Superintendent of Police (SP), Prashant Gautam at Pasighat. Mishra emphasized on proper implementation of development plans and projects, and advocated ensuring transparency, accountability and continuity. He directed the DC to ‘take special initiatives to ensure that fruits of all government schemes reach the lowest strata of the society’. Mishra also asked the SP to ‘have an insight into the law and order situation’ prevailing throughout the district and take measures to ensure fool proof safety and security for all. 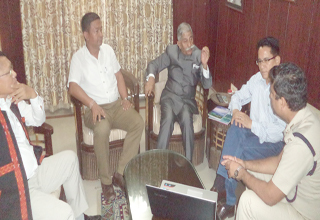 Tatak and Gautam briefed the Governor on the status of government-sponsored programmes in the district. The DC assured the Governor that the district administration has been on ‘its toes’ to extend the fruits of governance to all sections of the people. Retired Indian Air Force (IAF) group captain Mohonto Panging also presented a brief report on the ongoing Army recruitment and training programme in Pasighat. Geku MLA Olom Panyang was also present at the meeting.